The Fight for ₹100/- an Hr. 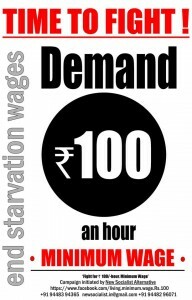 Living Minimum Wage campaign has been striving to bring home this point to the workers and our CLASS in general, that when the bosses and their political representatives in BJP, Congress, JD, SP, DMK and AIADMK etc., who boast to one degree or the other that “India is on a trajectory of HIGH GROWTH, and is poised to be the super economy in the coming years”. But the question in all this cacophony of the rich classes the 1% of India, what is that the ground soldiers, the 99% of India, who make this happen through their labour are themselves getting in terms of income and wages. The captains of the India’s Industry and the various Governments both at the centre and States of various shades of the same bourgeois ideology who talk in terms that the Indian economy has turned its course and now hovers around 7% to 9% growth in the last 15 years , and presently “claim” that it will beat the general trend of economic down-turn in the global economy and would still grow at the speed of 7% or so, but fail to address the question of the poverty conditions of vast multitudes of people getting near-starvation wages. In India,according to an ILO report published two years ago, in the last decade the total employment grew by only 0.1 per cent yearly over the five years till 2009-10, says the report, “from 457.9 million in 2004-05 to 458.4 mn in 2009-10, while labour productivity grew 34 per cent over this period”. In year 2012 the Government of India appointed committee on Unorganised Sector came out with a damning report, which pointed out, that over 77 per cent of the populace, or an estimated 836 million people, earn an income of Rs 20 per day and over 300 million are living below the poverty line. It is welcome that the Trade Unions and the workers organisations have started to question and challenge this scandalous STATUS-QUA in relation to wages. But one has to point out that the significant share of the blame for such a sorry state of affairs for the overwhelming section of the working people who constitute more than 90% of the work force who create the wealth, yet euphemistically called as “informal sector” are made to languish in such criminally pathetic economic and social conditions lies with the lackadaisical attitude of the leadership of the Central Trade Unions, who have a very flippant attitude in strategising the demands and building the struggles to achieve them. Especially in relation to the Minimum Wage, there has never been a scientific approach in arriving at a fighting proposal that will galvanise both Organised and the un-organised work force. As it has now become explicitly evident from the life story of Radhika the mother of Rohit Vemula who was forced to commit “suicide” by the Systemic Malice in the Caste driven society of India, she is eking out a “living” through Tailoring with near poverty income, it is overwhelmingly the Dalits and the other oppressed castes and classes that constitute the so-called “informal labour”. In the shrill noise “Incredible India” project rhetoric, which is totally one-sided, and is out to create a further brutal inequalities for the poor and oppressed. In fact the PM Modi’s pet project “Make In India”, it is the INEQUALITY that is made in abundance. No half way house measure is possible as for as the pro worker’s reforms are concerned, whether it is the Minimum Wages, Decent Working Conditions, Housing and Jobs, a resolute, militant Class struggle is the only way forward, a bold challenging set of demands and a clear strategy to win and go forward is the need of the hour today. In that context the New Socialist Alternative (CWI-India) and the grass roots volunteer base of Fight for ₹100/- an Hr. Living Minimum Wage will do everything possible to carry the struggle forward while cooperating with the Working Class people & Youth to build a powerful force. It needless to emphasise that the leadership of such a movement can only come from the most advanced layers of Women & Men belonging to the Dalit and other oppressed sections who have begun to assert their rights in the Indian society today. Demand Justice and Minimum Wages for RECRON workers! We Demand the Right to Dignity! !